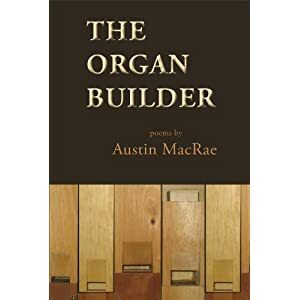 In his debut poetry collection, The Organ Builder, Austin MacRae crafts a world for his readers where the nuts and bolts of everyday existence are extolled. This is a book of creations, both natural and man-made. Through these poems, the reader is invited to examine details, the building blocks of all things, like the cambium under the surface of bark, the heft of wood beneath a carpenter's fingers, and the life experiences the speaker carries with him like burls in a tree's trunk. Here, nature, family, and the everyday come together as the building blocks of voice. MacRae's is a fresh voice in contemporary poetry that awakens gendered masculinity in a subtle manner and celebrates craftsmanship in both form and content. Familial relationships play an important role in the creation of voice. In the collection's namesake poem, "The Organ Builder" the reader is introduced not only to the significant relationship between father and son, but also the cycle of creation that continues throughout all of the poems. "The Organ Builder" outlines, in beautiful detail, the making of the organ builder's "long-unfinished masterpiece" from the "pinewood pipes and marble stops" to the music of Bach. As a reader, we observe the craftsman create as a wide-eyed child does, seeing how the "light glistens round like a caul" as piece by piece, the organ comes together in an almost holy fashion. However, not only is the organ that's born from the carpenter's hands, but also the speaker, the son, whose hammer, at first, creates only a "rickety music." Throughout the course of the sestina and its piercing turn, when the "hammer slips, shattering" his childhood, the relationship between father and son turns, instead, to one of two "craftsmen conjuring a centrifuge/of sound" together. At the end of the poem, it seems that both masterpieces, both creations, are "alive and rising, rank on rank, to sing," (32-22). The cycle complete, the son, too, becomes a man whose hands shape and craft the world around him. The speaker brings us into the world that shaped and crafted his voice. We're asked to examine the "seasoned face/ of sun-cured, rough-cut planks of oak," and to take in the "sweet- smelling place," the father's workshop where he learned how to create, though in a much different manner, with hands of "softer spruce," (29). The poem "The Beaver Pond" expands on the relationship between the creator and created, and outlines the shrinking of a pond where the speaker had a lot of time as a child, "shin-deep in murk.white legs socketed." The speaker reflects that the pond "shrank the first year of my father's illness," and slowly "drained away." One cannot help but parallel the two, the father's illness and the shrinking pond. However, the sonnet closes with a couplet that expands the poem further: "as any soul would have it, like a birth/ a green and yellow meadowing of earth," (30). This shows the cycle of creation, the beauty that comes from death, the continuance of craft, and MacRae reminds us of how this is inherent in all of nature, both in humanity and the world around us. Many of the poems in this collection also hold up a magnifying glass to the fascinating and sometimes perplexing craftsmanship in our natural surroundings, from the roots of aspen trees that are "cool / and faithful as the surface of a lake," (2), to a "glistering shoreline," an "inner world of whorl on whorl" that exists inside a conch shell (3), to the "folds crammed full of bugs and seeds" of a wild rose that's more beautiful because if its "wildness" and "ragged petals," (7). MacRae ties these observations of nature back into the speaker's own identity, showing how these natural occurrences shape that "cruel boy beheading goldenrod," (2). Another, perhaps more chilling, example of this is the poem "Chain." The poem begins with a seemingly commonplace experience of walking the dog, until the reader is introduced to the "four eyed creature" that spooks both dog and human and "stares… with equal parts of fear and hate." It becomes apparent, at the sonnet's volta, that the chain in the title not only refers to the dog's chain, but also to the feeding chain — the "creature" is in fact two, a "snake has half- engulfed a mouse who's still/alive." The speaker reflects at the end that it's "the most unnatural thing we'll ever see," though really, it's just a part of nature's strange and baffling craftsmanship (13). These experiences with nature's artistry, these "gentle warnings that the world is real," play an important part in the creation of voice (12). In contemporary poetry, we often don't attribute the notion of being gendered to a masculine voice; instead, it is seen as something neutral and somehow free of categorization. However, in The Organ Builder, we are subtly reminded that masculinity, with all its complicated glory, is alive in poetry, too. The reader is brought into a world where Axl Rose is a god and "wimpy biceps" are inked with bics (37). The poem "Smear the Queer" is seething with adolescent tension, where boys are roughed up and "dogpiled to oblivion" by each other (38). We even get to meet a peculiar and inventive man dubbed "Lawn Chair Larry" who attempted the impossible - to make his lawn chair fly using weather balloons. The speaker, with the "bare essentials: Miller Lite / a tin of Spam" and thoughts of Larry, experiences the magic of "an average guy/ inflated by. huge stupidity," rising above it all, "so briefly, free, (43). Again, with precision of meter and attention to detail, the reader is made privy to the building blocks of voice, of a gendered identity that is at once emotionally honest and crafted. The fresh take on the gendered voice in poetry left this reader feeling utterly "blessed / delighted that the aftershave still burns," (27). What is perhaps most admirable about this collection is its range. The poems presented here tackle issues from a father's illness, experiences with death, the sublime, and then, on the other side of the organ's scale, are poems such as "Mowing" and "To Hugh Hefner, To Make Much of Time After His Divorce." In this sense, The Organ Builder provides a fresh voice in contemporary poetry, one that is not afraid to address, in a particularly apt example of a villanelle, no less, the "man across the street" mowing the lawn who, "has no clue his crack is showing," (42). The Organ Builder allows readers to observe the intimate process of creation - whether in nature, at the hands of a master craftsman, or the creation of an identity and voice carved by the everyday experiences. MacRae's poems are rich in detail, honest in emotion, and vital at heart. These poems ask their readers to meditate on what makes us human, what crafts us, the nuts and bolts of who we are, and we are made richer for it.